One of the first times I gave my son cow’s milk, it was a disaster. We had finally found an inexpensive source of fresh, local milk from grass-fed cows. I celebrated by serving cereal for lunch (no need to point out that cereal canceled out the health benefits from the fancy milk. Whatever. I’m all about balance). A few minutes into lunch, I heard heavy breathing – almost wheezing. When I looked at the table, my toddler had a bright red rash creeping up his neck and chest. He sounded like he had asthma. Lunch was over, and after the next doctor’s trip and a quick test, we didn’t touch dairy again for 3 years. Minus one infamous drive-thru incident. Since then, we’ve reintroduced dairy with no side effects, I keep a careful eye on cost and quality. We know now that we don’t need tons of cheese and milk to feel satisfied. But man, life is better with butter and yogurt. Saving money while eating healthy is a balancing act. 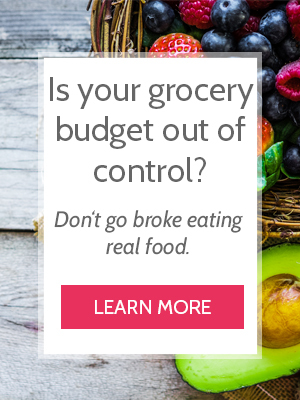 Whether you’re navigating allergies, or your goal is to eat on a tight budget. Or maybe you want to eat local and organic products as frugally as possible. No matter what, you need to find a balance that works for you. The last few months, I’ve been breaking down How to Build Your Frugal Kitchen with Real Food by tackling each food group. So far we hit Grain, Meat, Produce, and today Dairy takes the spotlight. Here’s how I get the most out of my dairy products. You can use these tips for marked down cheddar from your grocery store or raw milk from a local cow share. Find your balance. Make sure you store dairy products in the proper place. Milk that’s stored in the door of the fridge will spoil much faster than milk stored in the back of the fridge. I keep all of our shredded cheese in the freezer. It stays fresh, it’s still easy to work with, and I don’t need to worry about it spoiling. Meanwhile, yogurt and butter keep in the fridge for a really long time. There are approximately 87,546 kinds of dairy products. But did you know many of them can be substituted for each other? When you have a tight budget, learning how to substitute specialty ingredients is key. I can’t afford to buy a whole half gallon of buttermilk when the recipe only calls for 1 cup. While I might be able to whip up a couple batches of pancakes to avoid wasting the rest, I would rather use something I already buy and eat regularly. For example, if a recipe calls for buttermilk, I use yogurt thinned with milk. If it calls for ricotta, I might use a cottage and cream cheese concoction. I’m not claiming you will have consistent or gourmet results. But you will save money and eat well. Let’s not dwell on how gross the word “ferment” sounds. Homemade yogurt and kefir keep well much longer than fresh milk. If you don’t love the taste or texture, you can use them in smoothies or baking. Homemade yogurt is fairly easy if you use the crock-pot or Instant pot method. If you want to save money in that area, take 5 minutes (yes, 5) on a weekend and try it. Homemade kefir is almost fool-proof and doesn’t involve heat or strict measuring. If you can get a hold of the starter from a website or a friend who has some to share, give it a go! Saving money and eating healthy is a balancing act. But it’s one you’re in charge of. You get to decide what you prioritize. When it comes to dairy, some of the best ways to save money are learning how store it, freeze it, substitute, and even ferment it. I’m so glad you mentioned homemade yogurt. Can you provide specifics? Like… how much milk does it take to make how much yogurt (i.e. 1 cup milk yields how much yogurt, etc). I’ve wondered if homemade will safe money/how much it will save. I’m loving finally having the time to go through your posts! Hi Kim! Homemade yogurt yields the same amount of yogurt as milk – so if you use 1 gallon of milk, you will get about 1 gallon of yogurt. When you compare the cost of yogurt and milk, it saves a lot of money! There are trade-offs, like the learning curve and a little bit of time. You also may need to monkey with temperatures to find what yields the thickest yogurt for you – it’s not always as thick as store bought. But I think it’s worth it, and we’ve saved hundreds of dollars over the years making our yogurt! Use plain unflavored gelatin to thicken it. I get mine at a baking outlet in the city, keeps forever. Yes! Okay, so I’ve tried this before, but it ended up being an icky consistency – like chunks of gelatinous yogurt mixed with normal yogurt. I might try it again now though! Any tips?